For the second time in a week, Presentation Secondary School Warrenmount are pleased to announce that we have been featured in the Irish Times! 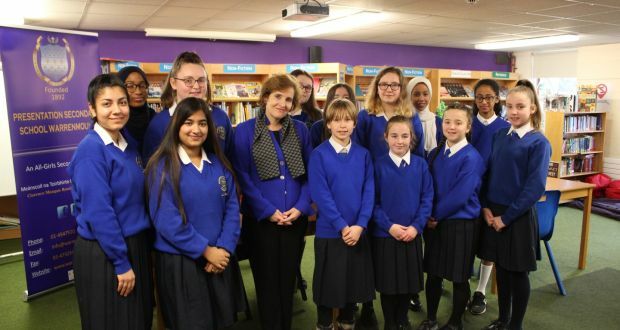 On a recent visit to Ireland, Alice Albright came to Warrenmount and praised the Irish Government’s decision to increase it’s aid contributions overseas. Alice Albright is the Chief Executive Officer of the Global Partnership for Education and the daughter of the first female U.S. Secretary of State, Madeleine Alright, who served under President Bill Clinton. We were honoured to host Ms. Albright and are delighted to be featured in the Irish Times. To real Carl O’Brien’s full article on Ireland’s committment oto education in developing countries, please click here.